That might be the best word for it. When the Ultras arrived to an already long line of people waiting for food and t-shirts, we were impressed. When they just kept coming, we were floored. Michigan Athletics reminders and our hard selling at FestiFall worked better than we ever could have imagined. 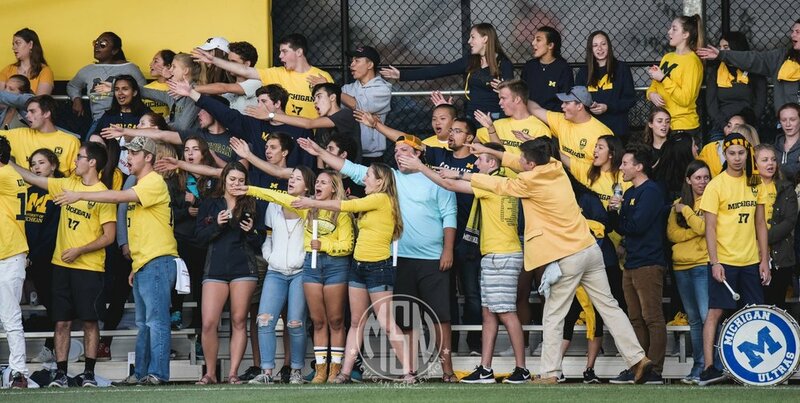 Over 1,200 students showed up..... to a Michigan soccer game. They were ready to cheer, heckle, and scream right along with us. Clearly feeding off the energy of the fans, the team put on a show for us. A very early goal from Ivo Cerda (with a beautiful assist from Robbie Mertz) quickly clued us in that we were in for a good night. Marc Ybarra closed the first half with a goal off a corner kick from Tristan Jacob and we went into halftime happy. A Badger goal slipped by in the second half, but no matter, the Wolverines held strong to open the Big Ten season. What a game. What an atmosphere. I haven’t seen anything like it. Let’s keep it up. Hey, Athletic Department, free food every game? Utterly and completely ignored. However, the students attending their first soccer game seemed to enjoy our comments, so we’ll consider that a win. Hello, fans of soccer. Or football. Fútbol, footie, that game from modern classic Kicking & Screaming. Whatever you want to call it, it’s back at Michigan. And of course, if soccer is back, then so are the Ultras. If you’ve ever been to a game at UM Soccer Stadium, you’ve probably seen us. Or more likely, heard us. We’re the really loud, arguably obnoxious crew with the drums and flags, screaming and cheering as loud as we can. Most importantly, we heckle the refs. 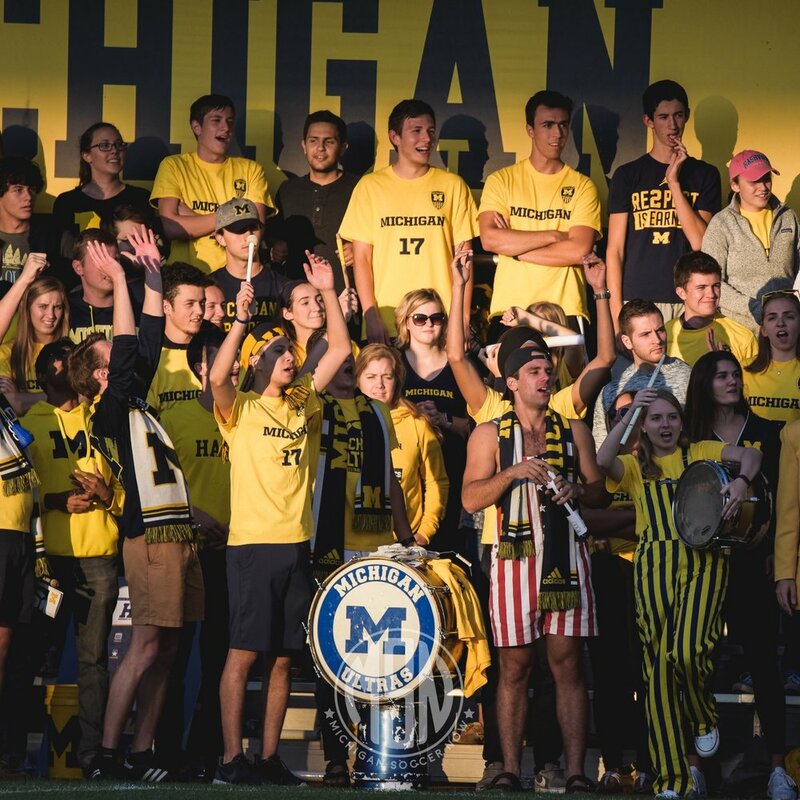 Michigan soccer has already had a few games this season, but Monday, September 4th against the Dartmouth Big Green was the first game where we were all back on campus. As the Ultras were happy to be back, they descended on UMSS in a blaze of Maize glory. What a glory it was. Our voices were gone by the end of the first half, and neither team had even scored yet. We started small, with most students beside us sitting down and not cheering much. In the second half, captain Billy Stevens was on our side, and there is no player that gets us going quite like Billy. He beckoned the students to stand up, get loud, and support his team. We all professed that we are all Billy Stevens’ girlfriends. He hugged me; I teared up. But in the 82nd minute, our beloved Frankie “Sneaky” Atauhene really kicked it up a notch with a beautiful goal that would be the only one of the match. The Ultras lost it. Even Billy came over to celebrate with us. And after 90 minutes of cheering, clapping, and heckling, the Wolverines came out on top and, in our favorite part of every match, celebrated with us. They always thank us for our support, but really, guys, thank you. The least desired referee position is the line judge that has to stand near the Ultras because we spend most of our time heckling him/her. We typically refer to them as dad or mom. We were, unfortunately, mostly ignored by the ref this game. We got one or two heavy sighs, but most of our comments asked about his two watches, his Britney Spears mic, and why he didn’t come home for my last birthday. All of which, to his credit, went unnoticed.